I find myself agreeing with both you and Cohrane. It *is* true that modern macroeconomic models are not in a place where one can claim they are a scientific basis for recommending policy (though this applies just as much to ‘freshwater’ macro as to saltwater). On the other hand, there are reasons for stimulus that do not rest on these models, such as low borrowing costs and much needed boosts to infrastructure. Cochrane is right about the former, but is kidding himself if he thinks that is the only or main reason economists are recommending stimulus. “In other words, unless the economic model has already been worked out before a particular economic problem arises, no economic policy conclusions may be deduced from that economic model. May I call this Cochrane’s rule”? Yes you should. If you want to test a policy, without knowing with a certain degree of certitude the effects in advance (as you don’t have the right model), you might do that. Any possible failure, though, rests on the shoulder of a poor science, as the one you advocate. Until now I have not read John Cochrane regularly. But I intend to start doing so, because there are precious few people these days writing in publications such as the WSJ, that more growth is needed. Too many people on the left and the right, are convinced that more growth is not needed. Perhaps macroeconomics is not a “failure”, but it darn sure needs to become more of an applied discipline for real growth solutions than it presently is. When (does Cochrane say) did US business leaders and entrepreneurs became a band of weenie-wimps? I am all for the least regulation and taxes possible. Maybe even a right-winger by some standards. I am certainly pro-business. But taxes were much higher and regulations arguably more onerous in the 1960s—and real per capita incomes boomed by one-third in the decade. 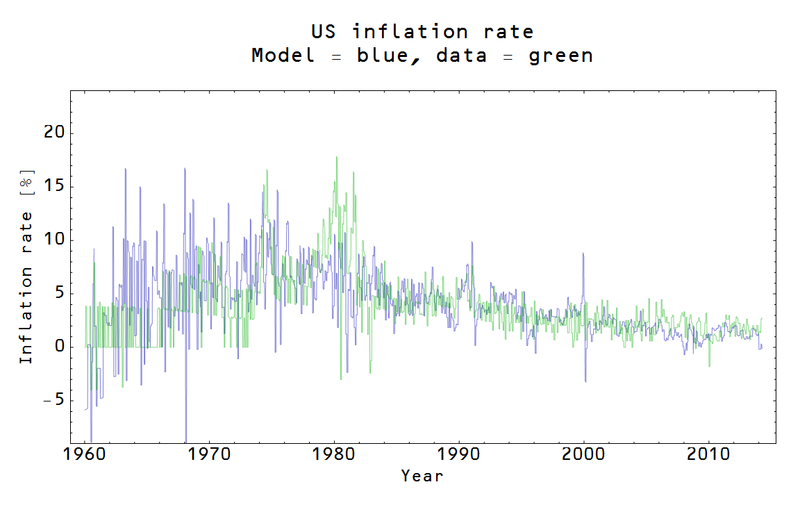 Inflation was not as high as remembered, but did top out at 6 percent in 1969 (as measured by CPI, it was lower on PCE). An talk about structural impediments? Big Labor, Big Steel, Big Auto, little foreign trade, rate-controlled transportation, rate-controlled savings, and a top MTR above 90 percent! Moreover, we had a huge military complex, consuming 10 percent of GDP (Russia was Russia in those days). The the economy boomed! Thanks to a pro-growth monetary policy. Then we had a good run from 1982 to 2007, with inflation ranging around various single digits, often more than 2 percent. Today’s business people have not had to face a Cuban Missile Crisis, a Vietnam War, race riots in the streets, or ever rising urban crime rates. I will concede the Iraqistan follies have been a gigantic waste of money and taxpayer burden. But basically, life has been easy, and government good in the USA. Business people are not quaking in the boots. Even more strangely, Cochrane recently authored a paper for the Hoover Institution, in which he advocated more QE until the entire national debt is in bank reserves. I wonder if this Cochrane WSJ soap-boxer is just a way to get his right-wing “fred” back. I do not think his Hoover mission went well. Unlearningecon, Sorry, but I had troubling figuring out what the antecedents of your pronouns in the last sentence. John, I wasn’t trying to be nice or “not nice.” If US deficits would produce no jobs in the US only in China, why did the recession in the US affect jobs in the US not in China? Agglomeration economies are very interesting, and deserve encouragement, but it’s not clear to me why it is cyclically significant. Tim, Sorry, just can’t figure out the antecedent of “the one” in the last sentence of your comment. TH, Thanks for the link. As I suggested in my post, axiomitization may be fine for geometry, but it is not conducive to the progress of empirical science. Karl Popper made that point at least a half century ago. Too bad economists have not been paying attention. 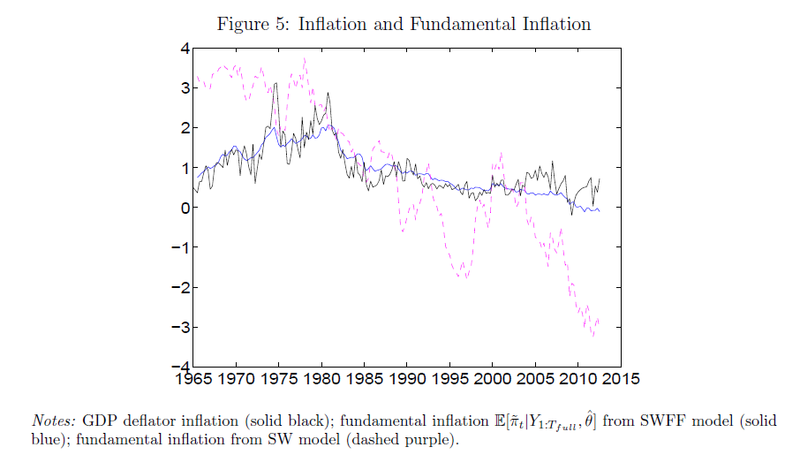 Alek, Noah Smith points out that in principle it would be preferable to have a single explanation for the recession and the slow recovery (especially since fast recoveries tend to follow deep downturns). Positing two different causes is ok, but the burden of proof is on the one claiming that there is a second cause different from the first. Benjamin, One would think that people would be aware of that history, but since it’s inconvenient, they just forget about it. I made the point a year or two ago when I criticized John Taylor for making this sort of odd historical claim. He tried to explain his way out of it, but not very convincingly. Tom, Noah is more sympathetic to New Classical type models than I am, but I generally agreed with what he wrote. Lee, Nice job. Economists don’t really require math models, but they have been brainwashed into thinking they do. “I just realized the NY Fed model has 42 parameters compared to the ITM model that has 3. By the AIC (which incidentally, Noah Smith just referred to a few minuted ago), that means the likelihood function for the Fed model would have to be 4.3 x 10^18 % in order to select it over the ITM if the likelihood of the ITM model was 50%. Or the other way … if the Fed model had a likelihood of 99%, then the ITM would have to have a likelihood of 1.1 x 10^-15 % to lose to it. Note: I cut out a word where I put “…” so as not to bias you. Does this seem interesting to you at all? Do you think the author of this new theory and accompanying models should be encouraged? David, I’ve got one comment in moderation. A quick follow on to the above: the same theory I discussed above produced these results with the empirical data in the left hand plots spanning multiple countries and decades. The clusters of theoretical curves are intended to give a feel for the theoretical distribution across random economies. 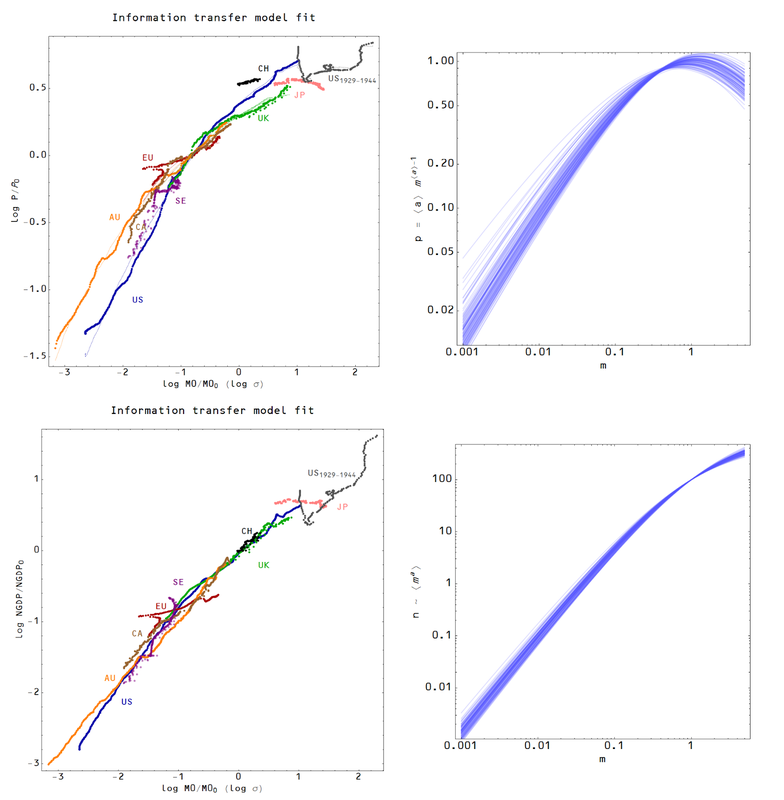 In the two sets of curves (top and bottom), there is “literally one parameter per country” according to the author. Tom Brown: I meant to write “right-wing cred”. Cochrane advocated converting national debt into bank reserves, at Hoover. I think the idea is not PC in right-wing circles and so flopped. By this very PC-rant in the WSJ, Cochrane is re-establishing his credentials. Sadly, macroeconomics is just politics in drag. … if you examine that last set of plots, you might be able to tell that the theory offers an explanation for why the QTM holds in some countries, over some time periods, but not in others. For example, even though Sweden is experiencing below target inflation, the theory says its CB should have no trouble hitting a “market based” target such as an IT, NGDPLT, or price level target, while it predicts some other CBs should have trouble with this. A statistic can be calculated to distinguish one circumstance (QTM holds) from the other (QTM breaks down). In addition, the theory is quantitative, but not ad-hoc (not based on regressions), and it does not require micro foundations and associated utility functions, agents, expectations, etc., but it does apply to micro too. And it is very much falsifiable. 2. each compartment may have newly emergent functions from inside, because they work according to different logics and also contain creative actors. In this case, A. in finance, the repo market took on mortgage derivatives to partly supplant Treasuries as overnight interbank collateral (and thus any sudden change in perceived value engendered systemic risk in that subsystem, freezing almost all activity and requiring a bailout) and on the other hand B. the housing market had been contributing substantially to DEMAND spending in the main real cycle of goods/jobs (to the tune of around $1 trillion a year). How could ANYONE ever have maintained that demand is not the problem, there? I am astonished and dismayed that 6 years after the crash, so many economists are still clutching at old inadequate models. It is hard not to see it as an analogy to medieval scholasticism. Why do they do it? Because they DO need math models — they have received this method from the other sciences where it is more applicable, and they have touted it as the method to pursue. It has gone so far as to get the psychology of the actors wrong: altruism is a big micro component in reality, for example, and that fact is denied mostly by corporate leaders and economics students who are taught that self-interest predominates. The true method for economics may be far more pluralistic and ad hoc. “With the government able to borrow at negative real interest rates, the present value of funding such projects is almost certainly positive.” This seems unlikely. You are assuming at the very least positive operating cash flows, and surely there are plenty of possible infrastructure projects where that is not likely (e.g., Amtrak). That said, there are plenty of conservatives (probably including Cochrane) who would could support infrastructure programs with a positive NPV, measured honestly with realistic assumptions. Of course, with an administration that labels every conceivable income transfer program a form of “investment,” one might be a little wary of its NPV estimates. But honestly and realism would force us to include the reduction of transaction/transformation costs of (say) Amtrak, which extends to a lot of money saved in automobile purchases, fuel purchases, highway road maintenance, etc, that would be required to perform the same transportation task of Amtrak by other means. Therefore the honest NPV must include much, much more than operating cash flows. Some of it is not even monetizable for calculation: personal time and physical effort that is saved, for example. Government like any institution can reduce transaction/transformation costs, and increase total welfare. It is curious (again) that conservatives who idolize Coase (correctly, IMHO) should ignore the direction of his central point! While you make an interesting theoretical point, one problem is that once you introduce the concept of non-quantifiable welfare benefits, you open the door to purely political manipulation. I don’t object to calculating the NPV of a project that is alleged to produce a public good by looking at a broader range of costs and benefits than just GAAP operating cash flow, so long as they can be quantified by widely accepted methodologies, consistently applied, and use realistic assumptions (about discount rates, utilization rates, etc.) Otherwise, every project that some politician wants to spend scarce public dollars on is presto-chango a valuable, NPV project. Prof. Cass Sunstein’s approach at OMB illustrates the kind of political manipulation to which I object. Not necessarily. There are two sorts of decision-making, by prices and votes. There are clearly non-quantifiable welfare goods, yet somehow we make decisions about them. What cannot be quantified can be decided by votes. Sticking to what is monetarily quantifiable doesn’t even solve the problem of political manipulation, it just introduces it through the back door. As we all know. What really is necessary is something else entirely, whether market or non-market. Any institution, market or non-market, needs an array of policies and conditions to work, as identified by Ostrom (another institutional Nobelist): narrow focus on the targeted objective, transparency, inclusivity (no free riders), sunset-ability, easy rules, easy dispute settlement, defined penalties, two-way responsibility, accountability, enforcement, etc. It is getting long past time for economists to realize that this too is the proper subject of economics, and that these things are what can make the provision of non-market, even non-quantifiable goods to be as efficient as anything performed by the market. As Coase said, economists don’t know half of economics. So your complaint is about the use of the word “investment”? I agree that our language has been over-economisticized (to invent a word), to the detriment of meaning and logic. But how else would you have a politician speak about education? Or speak about universal access to healthcare? Never mind the unquantifiable benefits to peace of mind and personal time saved, because even the quantifiable benefits are incalculable, due to the N-dimensions of future dynamic effects upon life and economy. To even worry about the dollar costs of healthcare in an era of plenty seems silly. What do you say to John Cochrane, who wrote that individuals must “feel the correct economic signals to shop for cost-efficient health insurance and health care”? I’m feeling I need an emergency appendectomy, but I must also have felt the “correct economic signals” to shop around: shouldn’t we declare that language obsolete, also? Yes, I think that the use of the word “investment” to describe transfer payments is dishonest, propaganda at its worst. Lee, regarding solving a 3-body problem, honestly, I’ve never tried (so I may be off the mark here), but I’d be surprised if a solution couldn’t be found numerically. However, I can certainly believe that a closed form solution cannot be written down, except for special cases. There is no general closed form solution for quintic equations (5th or higher order polynomials set to 0) either, but we can get arbitrary precision solutions to them using numerical methods.